One more year. One more time to apply the anodyne: "we'll be better next year". 365 days of cyber-banter-bullying-whining-pontificating. Ah yes, as December draws to a close, like he does every year, Armchair All-rounder falls into a nostalgic mood. He mulls over the many games he has watched or lost sleep over. Or both. He tries to categorize the crazy antics of the "Tigers". And from this amateur attempts at taxonomy we get yet another edition of the A-to-Z of Bangladesh Cricket. A is for Awesome. As in an awesome opening ceremony for the World Cup. Yes, as Saber bhai put it in so structured a manner, the WC2011 could have been utilized better from a commerce and tourism perspective. Certainly the team could have done better than crashing to two sub-100 scores. But none of that takes away from the sheer sense of awe one felt when the erstwhile Shilpa Bank building became a vertical, 20 story high cricket pitch and dangling dare-devils gamboled with a laser dot. I never thought I would see anything to top the 2010 Beijing Olympics, but in a cricketing context, Bangladesh delivered a sixer in its Word Cup kickoff. B is for Bokbok/Bakwaz. If cricketing matches could be won on the volume of hot air produced by a country's players, citizens and leaders, then the Tigers would be Clive Lloyd's Calypso warriors and Tugga's Invincibles rolled into one. Our players speak of maturing and of understanding what it takes to play at the International level. And then gift their wickets away. Our head coaches talk of dominating. And we dominate the punch lines of opponents' jokes. Our cricketing Administrators talk of world-class infrastructure and we end up with the only hover-cover in the subcontinent. (Look up the reasons why one would need one. Or not!) Last but certainly not least, ladies and gentlemen, I give you veritable doyens of à¦†à¦œà¦¾à¦‡à¦°à¦¾ à¦¬à¦•-à¦¬à¦•, Messrs. Shamim and Atahar. 'Nuff Sed. C is for Classy. As in a classy way to make amends for the actions of a few knucklehead followers of the Tigers, by presenting the West Indies team with flowers and positive placards. When some fanatics (and I intentionally use the extended version of the word "fan") did something vile (look under the letter V for more) it was the action of some quick acting fans that restored our rep to the world. 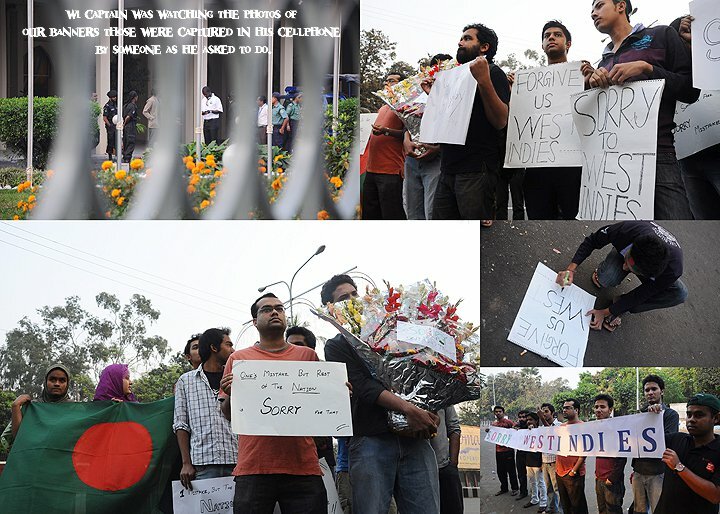 Started off as a Facebook campaign, the Say Sorry message quickly went viral and soon there were scores of fans outside Hotel Sheraton, bearing flowers and signs that amply conveyed regret. Even Gayle Tweeted an ack. D is for DRS. Or rather the continued absence of it. Since the days of Asoka, Bangladesh has copped more than its fair share of umpiring howlers. So one would think that when a means becomes available of redressing the inevitable, poor-team-gets-shafted-on-borderline-calls problem, the Bangladesh Cricket Board would be all over it. That it would pressure the ICC and renegotiate its broadcast agreements to ensure that the Tigers never played a match without Decision Review System (unless it was playing BCCI's living legends.) But no! The Board has nice boondoggles in Cox's Bazar resorts, puts in fresh flowers for visiting ICC dignitaries and spends oodles on all other things but not a dollar is spent on DRS. E is for Elias. As in Elias Sunny. The man with the sweaty palms was called straight from NCL and went on to capture the best figures on debut for a Bangladeshi. A Moni-esque SLA who is not afraid to flight the ball, Elias showed that his bowling was no mere flash in the pan by maintaining the same incisiveness against the marauding Pakistani team in his sophomore series. Provided he can stay away from either questionable curry or à¦®à¦¹à¦²à§à¦²à¦¾à¦° à¦®à¦¾à¦¸à§à¦¤à¦¾à¦¨ à¦­à¦¾à¦‡à¦°à¦¾ (depending on whom you ask), and find some way to shut down the sweat glands in his hand, we may finally have an SLA other than Shakib who can bowl in 5-day cricket. F is for First. As in First Class Cricket. Or it could easily be the grade this amateur arbitrator assigns to our administration (or lack thereof) for Failure to provide adequate First Class cricket for our Frivolous players. The Zimbabwe loss was assuredly due to a paucity of preparation in the longer format and with BPL mania about, the situation is unlikely to be remedied any time soon. G is for Gut. No not the intestinal fortitude kind. The other kind. You know, the kind of gut that stretches your pants and makes you punch an extra notch in your belt. It seems our players merely need a short break in their cricket to sprout one of these. No doubt the famous Bengali epicurean traditions play their part here but c'mon man! If you are a professional athlete and a 20-something one at that, there is NO Excuse for you to be sporting a jigglacious à¦­à§à¦¡à¦¼à¦¿! And yet they do, as do the Rampauls and Zaheers of the world. Somewhere in Colombo, an ex-cricketer-turned-politician no doubt beams appreciatively. After all, Mr. Ranatunga is the patron saint of "Bhuree-club-for-Men"Â. H is for Hossains. Or rather a tale of two contrasting Hossains. Nasir . Shahadat down Nasir has been the breakthrough player for the Tigers in 2011. The man who wrung a Commonwealth Gold Medal from a potential Ashrafool disaster (out giving catch practice) then proceeded to score a 50 on his senior side debut. An ODI 100 and a Test 50 also followed, as did an interesting WrestleMania touch to his wicket celebrations. For all the doom and gloom that surrounds Bangladesh Cricket Nasir is a reminder of the promise. If Nasir represents promise then Shahadat represents a sad tale of talent going to waste. The man who was shaping to be Bangladesh's pace spearhead has upped his grunts while dropping his pace. The control was never much to start with but when a player's NCL bowling economy rate starts to resemble a 20/20 bowler's stats then you know that all the partying and high-lifin' has started to take its toll. If you needed final, damning evidence of where this man's grey matter resides, do read his SRK interview. I is for Initiative. While sorely lacking in an official level, it is heart-warming to see players active and retired taking the initiative to launch grass roots cricketing schools in the villages and districts. We need more of these for us to find a way to the top in spite of our baggage. J is for Jamie. El à¦Ÿà¦¾à¦•à¦²à§à¦¦à¦¾ à¦“à¦°à¦«à§‡ Siddons à¦®à¦¾à¦®à¦¾. The Nabob of Negativity he was, but any man who made serviceable international players out of Imrul KaEdge and JunaEdge Siddiqui and Rokibble Hassan was bound to be missed. And he is. Jamie is no head coaching material but he clearly loved Bangladesh and even more clearly was a technical coach extraordinaire. Our batters and bowlers (recall he taught Shafiul his now stock, outswing delivery) have missed him greatly and one wonders if the warranted post-World-Cup coaching change could have been handled a little differently. Glen Turner has come and gone. Would Siddons have been a better Academy Coaching Czar? K is for Kamal aka Loitta. The man with the mouth. While not flashing V for victory signs like an out-of-touch PLO member, our man with the no-plan is busy making boastful claims of DRS -heard it during the England series, or decentralization - heard it every year, for the last 4 years, or professionalization of BCB - hah! Meanwhile our once respectable selection process has become a venue of mastani and the tea' best players' tendency to act like prima donnas is rising. Please ICC, just follow the Peter Principle and make him the head of an even more dysfunctional org already. L is for Law. A man who was not liked well enough to make the Australian 11 on a consistent basis is now our head coach. And he has his friends in all the assistant coaching roles to prove that he is indeed the boss. Stuart may be only six months into the job as head coach of the Bangladesh Cricket Team but already he has achieved a minor miracle. He has made people hanker for the days of Jamie "team goals" Siddons. M is for Mashrafe. Just like another superstar with an M name (Manning, Peyton) proved, by his absence, how irreplaceable he was (look at the NFL Indianapolis Colts results this year versus the last 5 years), Mash proved that there is him and a whole bunch of pretenders in the Rubels, Shafiuls, Robiuls of Bangladesh cricket. Why so much brouhaha about a man who has not encountered Ms. Pfeiffer even once in Test cricket? Because with Mash you get control. And you get mentorship. Oh and if there's a spinner operating, you can count on some lusty late order runs as well. N is for Nazimuddin. Provided TIK does not keep giving catches off his helmet or bowled while looking simultaneously befuddled and boisterous, Bangladesh just might have hit upon its ideal left-hand, right-hand opening combinations for Tests. Another NCL product, Nazim impressed with his temperament and his cover drives. Last but not least, he is one of McInnis' boys. O is for Ordinary. Never has an ordinary word caused such extraordinary furor as it did when our very own Fatty McFatty aka Mr. Tamim Iqbal Khan used that adjective to describe Zimbabwe's Brian Vittori. Granted Tamim had personal grounds to make that statement having just smashed that very bowler all around the park for a quick-fire 43 and even the next day, Vittori just grabbed one wicket for the innings. Yet, if Tamim had brushed up on Bangladesh's brief cricketing history he would have known that the team specialized in imploding against left arm seamers, even if they were of the caliber of Pedro Collins. Sometimes it is indeed better to let your actions do the talking. P is for Punters. No, not Australia's premier batsman of the last decade. I refer to the adrenalin junkies who derive pleasure in life out of predicting whether the next ball in an over would be a No Ball or not. Thanks to the sheer number of these fellas and the volume of money they are willing to plunk down, we had some promising cricketers throw their lives away. And in the process they reminded us that we have something to be thankful for: our players are so non-descript that they have managed to stay away from this seedy element in the sport. Q is for Quandary. 2011 might be the year when the biggest dilemma in our cricket, what do you do with Ashraful, finally goes away. The man had managed to piss off fans, successive head coaches and even his then skipper, Shakib. But then he pissed off the one guy he should not have. The man who runs our cricket. Ze Lotus. Bye-bye Ash. Come back only if you average 60 in NCL. For the next two years! R is for Revenge. Yes it is never nice to be bowled out for 58 but by bowling out West Indies for 61 in Chittagong, Bangladesh accomplished some measure of revenge for their World Cup a$$-whuppin'. In a year filled with not much to cheer about, this one definitely brought about a smile on this Armchair All-Rounder's face. T is for Tutul. As in one-time footballing great Tutul. Obviously being a decent soccer player and fulltime strong-arm man for one of the à¦†à¦«à¦¾-à¦®à¦¨à¦¿ parties has made him well versed on matters cricketing: after all this is the man who believes BCB does not need a CEO, mere politically appointed board members will suffice. This is also the man who is making a strong play to be the successor to Mr. Kamal. Do a search for his name on BC. Then do a search for his name in Daily Star or Prothom Alo or Ittefaq or Inqilab. Once you have read up, go ahead and put on your adult diapers (and for the KDPP members, Huggies), because crap is going to be hitting the system in force and en masse. U is for Uno. As in Numero Uno. You didn't think an article on Bangladesh Cricket could just have one reference to da Shakster did you? For a country that is used to being number 1 in corruption, in pollution and in a plethora of other not-so-nice things, here are two Number 1s that we can all relish: Number 1 All-Rounder in ODIs. And, for the first time for a Bangladeshi, Number 1 All-Rounder in Tests. That Shakib transplanted a living-legend like Jacques Kallis to earn this lofty position just rams home what a monumental accomplishment it is. Shakib will never play more than 5-6 Tests in a year, he will often not get to bowl at an opponent twice or with any weight of runs and he rarely will have the luxury of friendly umpiring. And he has to deal with BCB. Now that's a load! V is for Violence. As in Crowd Violence. Sadly our fans are reaching their breaking points and getting in touch with their inner shot-putters. Projectiles were hurled at the West Indies team bus after the Tiger's 58 debacle. And then just to make sure we did not draw conclusions from only one data-point, bricks were hurled at the Umpire's shuttle at the recently concluded Chittagong Test against Pakistan. Yes, there are grounds for frustration in both instance but clearly violence is not the answer. W is for Word Cup 2011. Even if one puts aside the gorgeous opening ceremony, Bangladesh had its moments in the tourney. Beating England will be my favorite, especially for the quick-thinking manner in which Mushy dismissed his England counterpart Pryor. X is ... umm a little help? Y is for Yasmin Boishakhi. As in Yas and Panna and Kubra and the gang of pioneers who won ODI status for Bangladesh in women's cricket. Yes the standard is not the highest but these girls play for nothing but the joy of sport and they make us proud. And yes, in choosing a marginal player as the "name"Â, I am clearly just trying to find a Y! Z is for Zen. As in Inner Zen. If you are going to be a follower of Bangladesh cricket (or anything pertaining to the country for that matter), you need to have a fail-safe and instant-on means of connecting to your inner Zen. Be it prayers to à¦ªà¦°à¦® à¦•à¦°à§à¦¨à¦¾à¦®à¦¯à¦¼à¦¿ or Tai Chi breathing exercises or hitting a bottle of your favorite libation, it is highly advisable that you have this accessibility to calmness and inner peace handy: A brain-fart batting collapse, dropping of a sitter or somnambulant fielding attempt is just around the corner when our Tigers are on the prowl. Have a great 2012 everyone. See you on the forum pages and BC chat room. This page has been viewed 6712 times.